It’s about you, and the people clinking their glasses with you. It’s about birthdays, holidays, fancy dinners and nights in with friends or loved ones! Because in the 1000s of years of drinking wine, one thing has never changed; you don’t drink a bottle of wine, you share it! 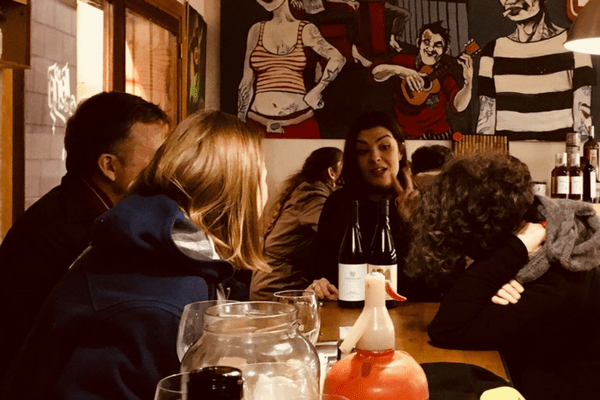 No matter what your wine knowledge, our Barcelona wine tastings are always fun and informal, packed with stories straight from the vineyards. 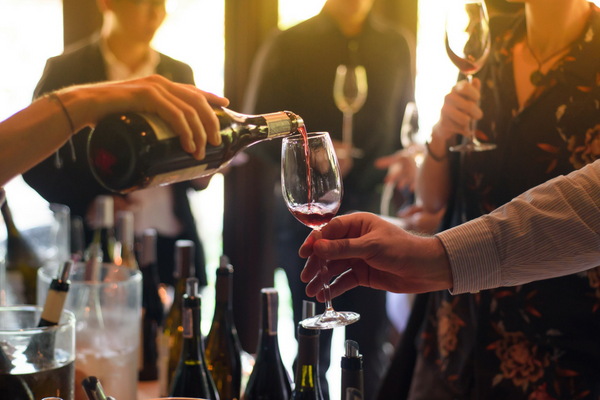 All of our tastings are suitable for beginners and wine enthusiasts alike! You will leave educated, entertained and thirsty for more! We’ll teach you the basics of Spanish wines, regions, and grapes ensuring you leave with an increased confidence in all things wine, and most importantly a smile on your face! Tastings usually take around 2-2.5 hours with lots of delicious food and plenty of wine-related chats and laughs along the way. PLEASE NOTE: All tastings require a booking in advance. If you would like to book any of the wine tastings below, send us a message on our contact page, and you’ll be a Spanish wine expert in no time! Vermouth is served from the barrel at the front section of the bodega to start your Barcelona wine tastings. We will then explain all of the history of this famous local drink, the story behind the bodega & vermouth culture in Catalonia and finally, how vermouth is made and what makes it so special and unique! A table will be reserved for you in the seating area of the bodega. Alternatively, you can avail of our private tasting rooms for larger groups or for those of you who would like a more intimate experience. There you will enjoy a selection of our favorite wines, which will be chosen for you. An explanation of all wines, their regions and qualities will be included in your tasting experience. We know that the best wine is enjoyed when paired with delicious food! Which is why all tastings include food boards over-flowing with Spanish meats / cheeses / olives & breads… make sure you don’t have a big lunch! All food & hosting included. A fabulous way to be introduced into the world of Spanish wine! Not a fan of white wines? Don’t worry – switch your white for another red! Platter of vintage 2014 Jamon Iberico de Bellota served exclusively in our bodega! All food & hosting included. Wines served in the Golden package are of a higher quality and usually chosen from a smaller production winemaker. 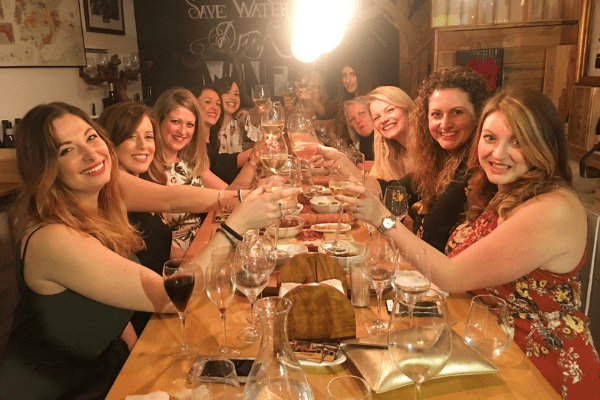 If you are a group of 6+ we can also offer the tastings below… as always we customise everything based on you, so feel free to contact us if you have any special requests! Cava is the famous sparkling wine of Spain… and has become synonymous with Catalunya, with 95% of the glorious bottles coming out of the Penedes Region. Essentially a less posh version of champagne, but technically, a whole lot more interesting!! Become a cava expert as you drink your way through different styles, varieties, and vintages and learn all about this famous tipple in this favorite Barcelona wine tasting! Mixed Platter of meats / cheeses / breads & olives. Followed by an assortment of hot tapas, modern Catalan inspired dishes… and of course… more wine!! Are you looking to explore a little bit? Want to taste and drink the best this neighborhood has to offer? We have teamed up with one of our favorite restaurants; which is one of the trendiest and local tapas bars in the Born, to bring you this great experience. You will enjoy a full tasting experience with us at the bodega, before wandering to the restaurant to delve into lots of the most traditional and delicious tapas in Barcelona! So what are you waiting for? Book your tasting experience today and get to grips with the deliciously tasty world of Spanish wine! Just fill in the contact form below and we will get back to you as soon as possible. Salut!